Healers are the most in-demand class role around, and good healers are worth their weight in gold. Healers are responsible for keeping everyone in the group alive. Being a healer means that boss-fights aren’t that memorable, since most of your time is spent watching green health bars. It has been described as “reverse whack-a-mole with the green bar.” You see things go down, you turn them around. So what are the healer classes in <insert your game here>? I haven’t the foggiest. 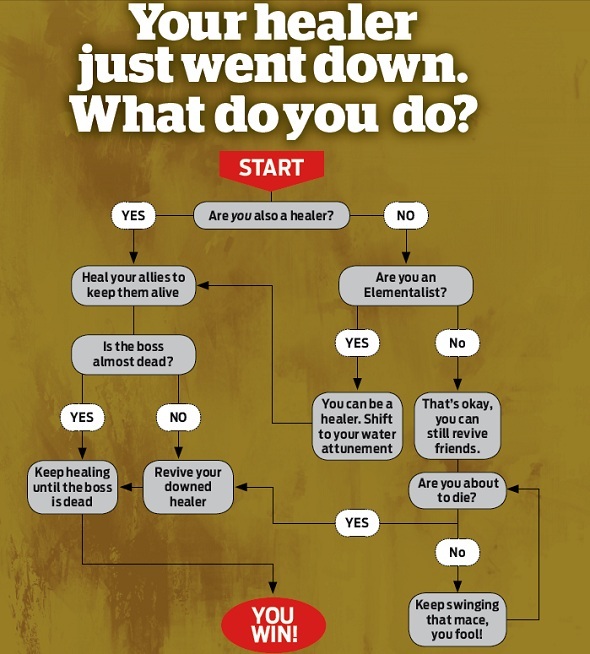 What I do know are the healers in LOTRO, SWTOR and WoW (courtesy of Chipchops)! So what does a healer class do? Resurrections or “rezzes” are used to bring a defeated player back into the fight. There are in-combat and out-of-combat rezzes in most games. Some healers have one or the other, or both. Rune-keepers for example, have one out-of-combat rez and one in-combat rez. Fitting in nicely with the Rune-keeper’s proactive use of HoTs, the rez starts as a buff that lasts the duration of combat that, on defeat of the buffed player, will rez the player next to the Rune-keeper. Captains have two rezzes that are both in-combat, but they are on long cooldowns. One is instant meaning that when a player dies, this skill is available for a short period of time and, when used, will activate instantly to rez the fallen player. However, this skill is “unaimed,” so if there are two people dead, it will randomly select one to rez. All classes (even non-healers) in SWTOR have out-of-combat rezzes, but only four have in-combat rezzes: the Sith Sorcerer, the Jedi Sage, the Scoundrel, and the Operative. Just like there is off-tanking, there are roles for people who can heal, but don’t want the responsibility of main-healing. This role is usually a “touch-up” role, which means an off-healer will kinda top people off on their health bars. Sometimes, an off-healer is specifically designated to take care of healing the main-healer, so the main-healer can focus on healing the tank and not worry about dying himself. Whenever damage to a party member is healed, it makes the monster that did that damage unhappy to see his work all for naught. This will make him upset with you, and he will try to rip your face off for it. You want to balance aggro with the tank and make sure that he always has the most threat. This can be achieved in several ways. First, avoid healing on too many targets. Not everyone has to be at absolute maximum health. It doesn’t hurt to let the occasional guy who accidentally stood in the fire regenerate his health naturally as long as he doesn’t stand in the fire again. Some games have a penalty for over-healing, which means healing for amounts over the amount of damage already done to a player. This really depends on the game, but sometimes healing for 100 when your friend was only down 50 points will cause you to gain 100 points of aggro, and sometimes it will only cause you to gain 50. It is helpful to notice what happens when you over-heal, and plan accordingly. You know the saying, “if Momma ain’t happy, then ain’t nobody happy?” Well, it is kinda like that with healers, except it’s “if the healer ain’t alive, then ain’t no one gonna be alive.” The healer going down can mean the end of the raid, because the tank isn’t meant to take damage indefinitely without heals before dying, and the tank going down means that the DPS will be attacked, and they aren’t meant to take damage at all, so very bad things happen when the healer dies! I always like to have two healers in a group, because they can keep each other healed that way, as well as having one healer focusing on the tank and one healer focusing on everyone else. This division of labor helps keep everything working smoothly. Apparently, the Monk class being introduced in the upcoming “Mists of Panderia” shall also be a trinity-hybrid class (all three roles, akin to the Paladin and Druid). Classes have, and likely will continue to be better suited for certain healing roles, and have different healing styles, as stated. Some are wonderful in 5-man dungeons, but not suited for raids (and vice versa). 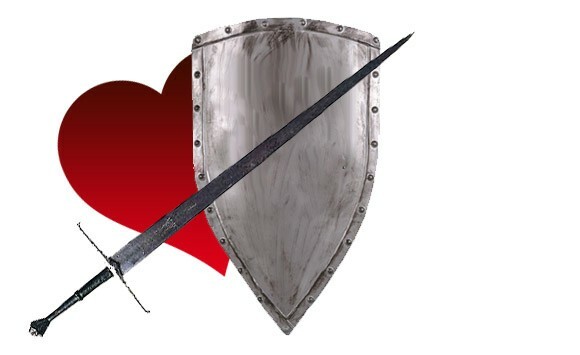 Some also serve better healing roles in PVP than PVE (and once again, vice versa). Some serve better as off-heals as opposed to main raid heals. Also, in a game that is continually changing, updating, nerfing, and buffing, these roles tend to change. Might I also add that as you’ve said “If mama aint happy…”, if the healer isn’t happy, chances are you’re moments away from death, unless they can put their personal feelings aside and simply do their job. Been there, seen that. I also look forward to trying out healing again in SWTOR, since I haven’t really healed much since “The Burning Crusade”. Props for a good foundation post, my friend.